Scientists directly observed the signal of iron and titanium atoms in the atmosphere of an exoplanet 600 light-years from Earth, a new paper reports. KELT-9b is a planet entirely alien to our own Solar System—it’s 2.88 times the mass of Jupiter, with a year lasting just 1.5 Earth days and temperatures over 4,000 Kelvin (3,727 Celsius). 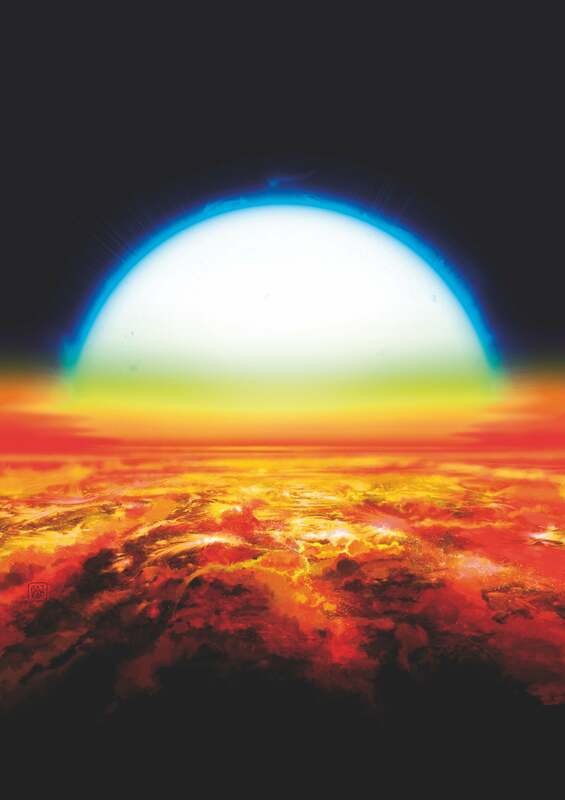 It’s the hottest known exoplanet, and the site of the first exoplanetary observation of iron and titanium atoms. It’s a stepping stone that will help astronomers one day characterise the atmospheres of more hospitable planets. The data came from a 31 July 2017 observation made by the Telescopio Nazionale Galileo on the Spanish Canary Island of La Palma. The telescope recorded the planet passing in front the blazingly hot blue giant KELT-9 star, essentially acting as a light filter, tweaking the colours of the starlight. Subtracting the light collected from just the star from the light collected when the planet passed in front of the star revealed the spectral lines of titanium and iron. The researchers also detected a slight shift to the spectral wavelengths: the Doppler effect signature of the planet moving through space. This confirmed that the spectral lines didn’t come from the star or dust in the intervening space, according to the paper published in Nature. Astronomers from the University of Bern, the University of Geneva, and others contributed to the discovery. The Bern researchers, without showing this data to Hoeijmakers, asked him to independently simulate KELT-9b to see if it would have visible iron. His simulations found that, yes, the planet should have iron visible to an observer. This bolstered their confidence that they had truly observed iron and titanium on the exoplanet. While iron is abundant here on Earth, it’s a difficult element to measure on exoplanets due to its optical properties. As far as Hoeijmakers and other sources we spoke to could tell, this was the first direct detection of an iron or titanium atom on an exoplanet, though other results have hinted at the presence of these elements. This discovery helps scientists determine the nature of the planet and how it formed. More generally, it serves as an important advance on the journey to fully characterising exoplanet atmospheres. Fully understanding an exoplanet’s atmosphere could ultimately help scientists tell the difference between an Earth-like or a Venus-like planet—a crucial distinction if you’re hunting for life. The goal is to find biosignatures, molecular spectra indicating that a planet’s atmosphere has been altered by some life form. Others were interested in the planet by itself. “It’s so strongly irradiated that it’s hotter than most stars,” Drake Deming, an astronomy professor at the University of Maryland who reviewed the paper, told Gizmodo. He noted that the most common stars in the galaxy aren’t like the Sun, but are cooler, dim M-dwarfs, as opposed to our sun, a hotter G-type main sequence star (sometimes called a yellow dwarf).